“GrandStream Wave” is a Soft-phone app that can be installed on your Android mobile phone and can be very easily configured to work with your DoorVaani SIP account. 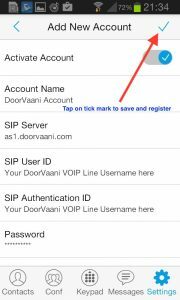 If you don’t have a DoorVaani SIP account, you can register your account for free now and then create your SIP account (a.k.a VOIP Line) for free. Please go to Google PlayStore on your Android Phone and then search for “GrandStream Wave” app. Download, install and then open the app and follow this easy to use guide with screenshots to configure it. Tap on “Settings” Gear icon at the bottom right hand corner. On the “Settings” screen tap on “Account Settings”. 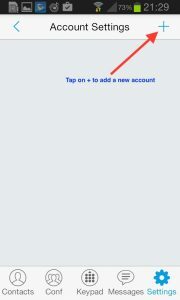 Tap on the “+” sign in the top right to add a new SIP Account. You will see the blank “Add New Account” screen. 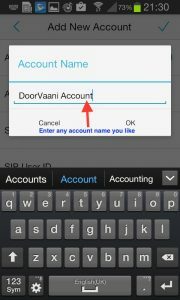 Enter any account name of your choice, for example: “DoorVaani Account” and tap on OK. 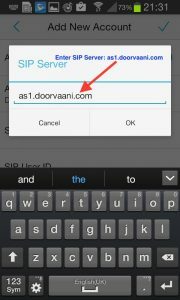 In the “Add New Account” screen (step 5), tap on “SIP Server” and then enter your DoorVaani SIP Server name: as1.doorvaani.com and tap on OK. 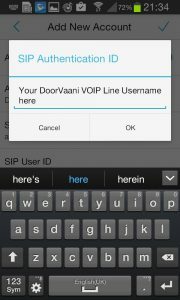 In the “Add New Account” screen (step 5), tap on “SIP user ID” and then enter your DoorVaani VOIP Line username (case sensitive) as created by you in your DoorVaani account. Tap on OK. 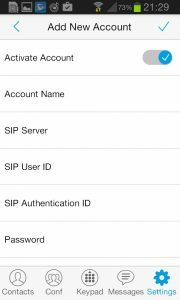 In the “Add New Account” screen (step 5), tap on “SIP Authentication ID” and then enter your DoorVaani VOIP Line username (case sensitive). Note: Your SIP Authentication ID is same as your SIP User ID. Tap on OK. In the “Add New Account” screen (step 5), tap on “Password” and then enter your DoorVaani VOIP Line password (case sensitive) as created by you in your DoorVaani account. Tap on OK. 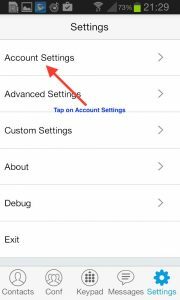 In the “Add New Account” screen (step 5), tap on the tick mark in the top right corner to save your account settings and also to register your VOIP Line to our server. After entering all of your account details your screen looks as shown in the following screen shot. Once your account successfully registers to our server, you will see your account name listed on the “Account Settings” screen with a green dot. Now you can tap on the “KeyPad” at the bottom and start dialling outgoing calls. 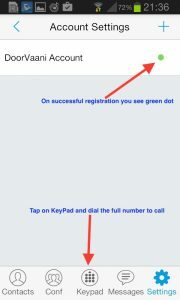 Please refer to step 1 above to see the screen shot of the KeyPad. 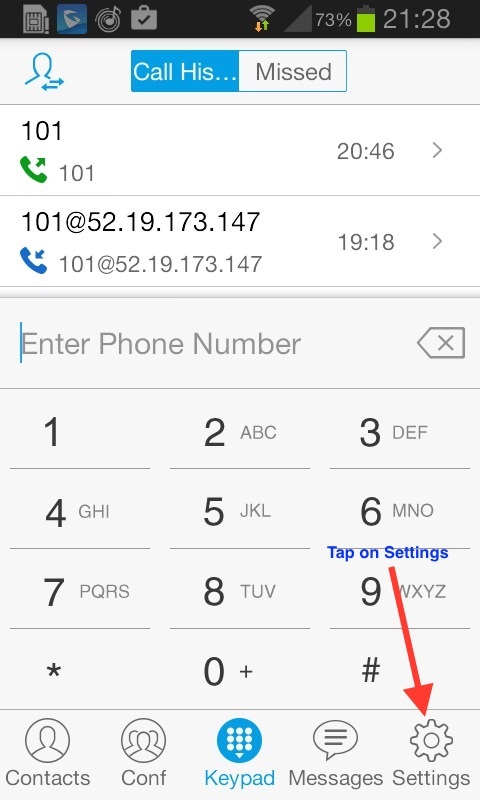 Please enter “complete called phone number” starting from the country code in International format. Green Dot Shown on registration. To call extensions within your own account, you can simply dial the short extension number of your called person. Important Note: To receive inbound calls, please ensure that your Soft-phone is always open and kept running on your mobile phone in the back ground. You can receive calls only when your soft-phone is kept open and running. You can add talk-time balance to your VOIP Lines either by “Shopping cart checkout” or from your Account Credit. For accounts with multiple VOIP Lines, it is best to buy Account Credit and then convert your account credit into talk-time balance. This blog post is on how to add talk-time balance by “Shopping cart checkout”. Please login into your account or if already logged in, please click on “VOIP Lines/Rates/Acct. Credit” menu under MY DASHBOARD to see the “My VOIP Lines” page. In the “My VOIP Lines” page, locate your VOIP Line and then enter the amount in the “Add Talktime” input box and then click on the “Add” button. Please see the screen shot below. Your talk-time order will be added to your shopping cart. You may see the “Added to shopping cart” message if you have not checked the “Don’t show again” check box before. You can click on “Go to checkout” or if you wish to do more shopping click on “Add more items to shopping cart”. When ready to do the checkout, please click on the “Shopping Cart” link accessible from the left hand menu and checkout your shopping cart by selecting the payment method convenient to you. Tip: Enable “Auto Top-up” of talk-time balances on your VOIP Lines to automate the whole process to free up your much needed time and never run out of talk-time balances! You will be able to make outgoing calls from any of the VOIP Lines in your account to only those countries that are in your “Outgoing Call Countries” list. This works as a great security feature and prevents your VOIP Lines from being misused either accidentally or intentionally. When a new account is registered, no countries are added to this list by default, so you should be adding these countries as per your calling needs. Please click on “Outgoing Call Countries” from the left hand menu to go to the page where you can manage your list of countries. The following screen shot shows the page with no countries added yet in the account. You can visit this page again to manage your list of outgoing call countries. You can view, add more countries or delete those no longer required. 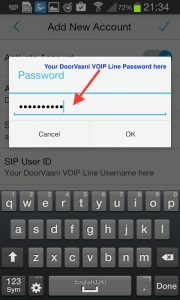 A VOIP Line in DoorVaani is basically a SIP Account and is needed by you to register your SIP Device to DoorVaani SIP Server, so that you can make and receive VOIP Calls. You just need to choose a VOIP Line username of your choice and a strong password of your choice and save it in your DoorVaani account. You would need this username/password pair while you configure your SIP Device to connect/register itself to DoorVaani SIP Server. You will see “My VOIP Lines” page as in the below image. You can also click on “MY DASHBOARD > VOIP Lines/Rates/Acct. 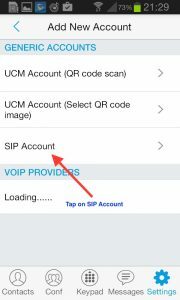 Credit” menu to go to the “My VOIP Lines” page. Please enter a VOIP Line username of your choice and a password in the two input boxes and then click on the Add button. VOIP Line username must start with an alphabet and should be of a minimum length of 6 characters. Both username and password are case sensitive. When you enter an acceptable VOIP Line username you will see a green checkmark as shown below. On clicking the “Add” button the VOIP Line is created and listed on your “My VOIP Lines” page. As soon as the VOIP Line is added it can be used immediately. If you need more than one VOIP Line, repeat the same process as above. You may want to add some talk-time balance on your VOIP Lines after creating them.